All updated sections are marked with § (Updated Jan 24, 2019). I’ve been using Anki since day one of medical school with great success. It has allowed me to have a life outside of studying by freeing up time for leisure, basketball, gymming, hanging out, tutoring, research, school club events, and more on top of all the material we have to study for classes. I never crammed for a single exam in medical school using this method. I constantly get asked about how to use Anki. Most people start using Anki and give it up shortly afterwards because of the steep learning curve in trying to figure out the software and mobile apps. For that reason, I am going to lay out how to use Anki for the first two years of medical school. I won’t go into why Anki works and how great it is, there are hundreds of articles on the internet detailing that (check the bottom of this article). For now, you should to do as I say and trust the process, but those of you who are curious I recommend reading the official Anki manual. These will be a series of posts about how to use Anki in different areas of studying such as for boards and for class. I tried to keep this tutorial as concise as possible without compromising anything. Stick with it and I promise you huge payoffs. If you have any questions, just reach out to me. Before you can follow along in setting up Anki, you will need to download the following. You can download Anki 2.0 or 2.1, whichever you prefer. Once you’ve installed Anki, you should download a few add-ons to optimize your experience. After installing all of the above, restart Anki and all the addons should fire up. Now that you have the scaffolding, it’s time to download decks and start using them. One of the best decks out there is the Zanki deck created by an anonymous medical student and edited/updated constantly by the Reddit community. This deck has detailed cards from all of First Aid plus Pathoma, BRS Physio, Sketchy Medical, and Kaplan Lecture Notes. There are other popular decks so pick one you like. My system will work with any deck as long as the cards are organized by tags. If you wish to use a deck which is not organized by hierarchical tags, you have to tag the cards yourself or download an auto tagger add-on. These decks can be found in the sidebar of the Medical School Anki Subreddit. I do not take credit for creating any of these decks and all copyrighted information/images belong to their respectful owners. To install a deck, download it and double click on the .apkg file. Anki allows you to have a different options group for each deck but you really need just two, the default and the one you customized. Initially, all decks should be set to Default. To change the options in bulk, click the gear icon next to the main decks, click the gear again in the options group ⟶ click [Set for all subdecks]. The decks titled “Combined Current” and “Combined Review” should have an Options-group setting of “50N 50R Ordered”. The “Combined Current” deck will include any cards that you are studying for your current module. The “Combined Review” deck will include everything that you’ve already covered minus the current module stuff. You are almost ready to start studying. First, go to the Browser and click [Whole Collection]. Highlight all of the cards and click [Suspend]. Suspended cards will be highlighted in yellow. As you approach a system, open up the browser ⟶ go to the relevant subdeck by clicking on the tags next to the browser ⟶ un-suspend any card that is relevant to you from that sub-deck. Optionally, move those cards to the 'Combined Current' deck if you are studying them for a current module. Having the “Combined Current” deck allows you to prioritize cards for your current module if you ever fall behind on reviewing old stuff). Once an exam is over, move all the cards from “Combined Current” back to “Combined Review”, and repeat this process for the next exam. Using this system, you should be chiseling away at the "Combined Review" deck day by day until all cards are eventually 'Mature' and are solidly ingrained in your mind. At the end of a module/class, keep in mind the suspended cards that you never went through for that module because either your curriculum did not cover them or you just didn't feel like studying them. These cards are still considered high yield according to First Aid and Pathoma so I recommend un-suspending them at some point and going through them just like your regular cards. As for cards that you made for class during a current module, it is up to you if you want to continue studying them or suspend them indefinitely (never delete them). I like to continue studying them since the interval keeps getting longer and longer and it takes very little time to review. If you follow my method, you will have 3 decks to study from each day (Class + Combined Current + Combined Review). Ideally, you will almost never have new cards in the ‘Combined Review’ deck. Click the [Stats] icon from the main decks and see how many new cards you have waiting for you. You study session should follow this sequence: ⟶ ‘Class’ ⟶ ‘Combined Current’ ⟶ ‘Combined Review’. Once you finish studying a deck you will see a ‘Congratulations’ screen stating that you have finished your reviews for the day ("Today's review limit has been reached, but there are still cards waiting to be reviewed. For optimum memory, consider increasing the daily limit in the options"). Because the options for these decks are set to 50 New and 50 Review cards, you may still have cards remaining. Always remember the number of new cards you have to complete for each deck per day. On the ‘Congratulations’ screen, click [Custom Study] and the first two option will show you how many total New and Review cards you have remaining in the deck. Select ‘Increase today’s new card limit’ and add cards on top of the 50 so you can reach your daily requirement. Do the same for reviews. Ideally, you want to complete ALL due review cards for each day. The 50N 50R setting allows you to have control over how many reviews you are doing so to not get overwhelmed on busy days. If you do happen to fall back on reviews, just increase the number the next day to make up (missed reviews always carry over to the next day). § If you feel overwhelmed by the daunting task of completing a giant deck, you can actually double your pace by tweaking one small setting. I was able to get through a deck of 29,000 cards in two months using this method. I will however warn you that you will be sacrificing some retention for speed. Retention and speed are opposites by nature whether you’re using Anki or not. I was willing to risk losing a little bit of retention in return for saving a LOT of time, and in hindsight it was absolutely worth it. I was able to focus on other high yield resources such as question banks and review books with the time I saved. To implement this, open up the settings for a deck and enter the number 10 under ‘Steps’. This setting means that if you answer a card correctly, it will ‘graduate’ to the next interval immediately, and if you answer it incorrectly, you will see it again within 10 minutes. This method in a way turns your deck into a giant quiz: simply press ‘good’ if you know the answer or press ‘again’ if you don’t. I recommend this setting for people who are stressed for time or those who are starting late. Anki is a commitment, for the best results you must study your cards EVERY SINGLE DAY, no excuses! When studying, you should always hit [Good] when seeing a new card for the first time. When that card comes again, hit [Good] if you remember it or [Again] if you don’t. Same goes for reviews and old cards. Never hit [Easy] unless you know the card cold and can recite it in your sleep. Study in Pomodoro intervals, otherwise it can get mundane sometimes. Don’t seek to be a perfectionist, just make the damn cards however you can and do them! Check out this SubReddit for inspirational music to study to. Show new cards after reviews: This setting is preferred because reviews are critically more important than new cards for the spaced repetition algorithm to work. Always prioritize reviews over new cards. Having the custom option of "50N 50R Ordered" allows you to be in control just in case you need to prioritize new cards on a particular day maybe because you are behind or whatever. On a day like this, do the 50 reviews which will take no more than 15 minutes and then just complete new cards until you are caught up. Steps: 3 15: This means that when you answer ‘Good’ on a card, it will be shown again within 15 minutes. When shown again and you hit ‘Again’ which means you forgot the card, it will be shown to you within 3 minutes once again. This continues until the card “Graduates” to the next interval. 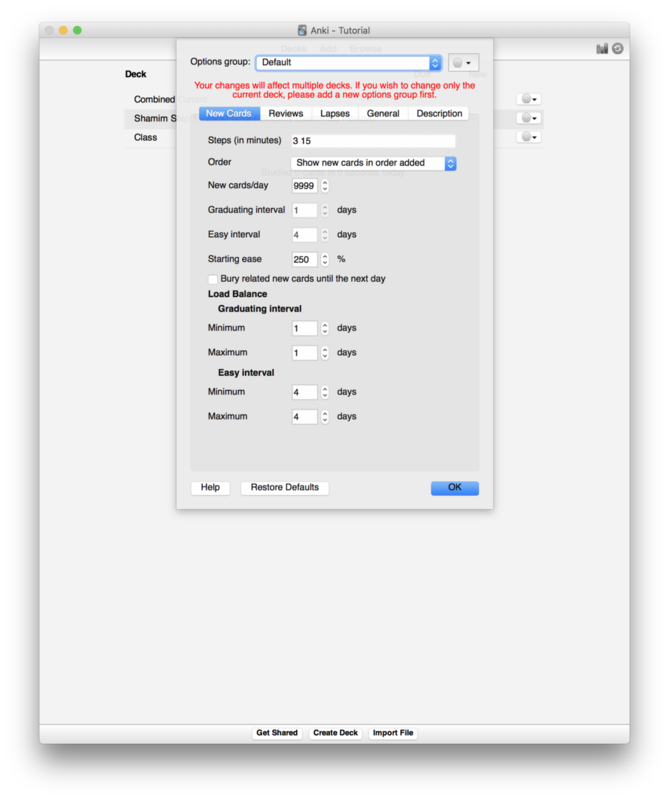 This setting alone ensures Anki’s failsafe method for memorizing. It does not allow you to move on from a fact until you know it. Maximum interval: The maximum number of days a card can go without you seeing it. Comment below and recommend what I should write about next! If you found an error in this article or just want to say hi, message me.